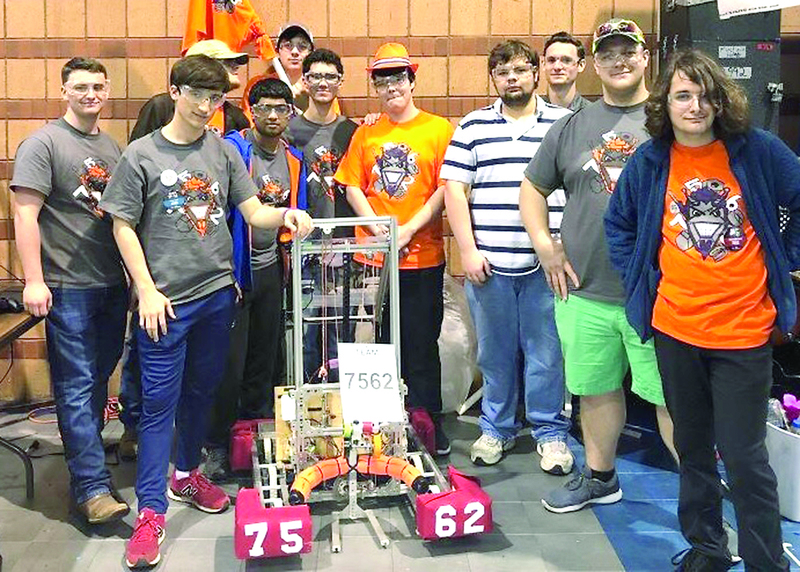 From left with Dante the robot are Jaiden Stark (’19), Karan Baker (’20), Eli Tomlin (’20), Riley Louviere (’19), Donovan Dowden (’19) and Ethan Swan-Begnaud (’21). Not pictured is Kaylan “La-La” Tyler (’20). The robot, named Dante by the students, is able to load cargo such as dodgeballs into specified boxes. The robot can also reach up to 5 feet in height to attach panels to designated objects, earning the team points in the competition. Students in the class worked on a variety of team projects, including chassis (the base of the robot), controls, build and design, challenge and art and media, incorporating the skills of LSMSA’s diverse students. The team placed 21 of 60 overall and tied for first place among the rookie teams. With a total of 132 cargo points, 46 hatch panel points, 99 habitat climb points, 102 sandstorm points and a record score of five wins and four losses, the team ended the competition with an overall ranking of 1.66, a high score among beginning teams.